MC - 1966-1977: Meter coupling added (often called MC bayonet) allowing full-aperture TTL exposure metering. Lenses are labelled MC Rokkor. X-600 - 1983-1998: X-600 mount reporting the lens maximum aperture design from the lens to the camera body which then engaged different sensitivity auto focus confirmation sensors in the camera body. SR - The SR models from 1958 to 1967 featured the initial design implementation of the SR bayonet. These were simple mechanical cameras without TTL metering or automatic exposure. The SR-7 was the only one with a built-in CdS meter, mounted on the side of the camera body and thus had the same metering capabilities as the external clip-on meters available for SR-1 and SR-3. MC - The introduction of the SR-T 101 in 1966 featured a meter coupling between a selected aperture on lens and camera body. The camera had two CdS cells inside the prism and metered the exposure through the lens (TTL). The later X-1 and XE models added an aperture-priority automatic exposure mode, and is also incorporated in X-700, X-500-series, and X-300-series camera bodies and variants (X-7, X-9, and so on). P (programmed automatic exposure) mode on the X-700. However, regardless of MD tab presence, or setting any lens to minimum aperture or not, auto exposure modes function using the remaining range of lens apertures between full open and the set aperture, if any. In other words, auto exposure will use whatever range of apertures the photographer chooses to make available, including the reduced range of an MC or MD lens that is not set to its minimum aperture. Note that Minolta cautioned that non-MD lens aperture blades my be too sluggish to fully adjust and settle down before exposure, suggesting that MD lenses were optimized for this capability. The XD-series cameras delayed exposure to take a second metering after closing the lens down to taking aperture. The X-700 did not incorporate a delay or second metering. f/3.5 or smaller maximum aperture. The lens tang operates a switch inside the body of the X-600. There is no MD Auto Exposure feature on the X-600. 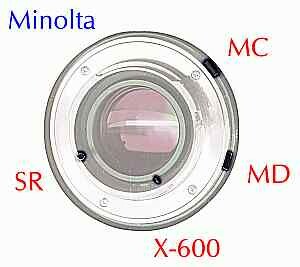 See also the Minolta SR mount category.